As the cut-off date for receiving QNR replies approaches (31st May 2016) final trickles of additional data are arriving. With 163 good quality datasets now in my datapool this constitutes a good basis from which to tease out meaning from the results and relate this to my research questions and hypothesis. This process will continue throughout the coming weeks and months and with close to 15,000 bits of data to work through there is plenty to be getting on with! a new research group which is everyone else – that is, students from both research groups DI and ND who are presenting a Dyslexia Index in the range 400 > Dx > 600.
which is all very interesting! The profiles of each of these four research groups is now presented on the QNR data profiles page of the project website. Data summary so far:The table below shows a summary of mean averages calculated so far and includes standard deviations where appropriate in order to calculate effect sizes. At present, this summary table (*NB: data summarized as of date of this post; UPDATED TABLE NOW AVAILABLE here ) represents the most cursory of data analysis with much more detailed work on the information held in the complete datapool to be undertaken in the months ahead. However for the moment, the information presented here is highly interesting and in terms of effect size at least, is showing a significant difference between the mean Academic Behavioural Confidence of research groups DI and DNI. In what way has a student with dyslexia learned about their dyslexia?It was felt at an early stage in the research design process that part of the enquiry would try to find out more about how dyslexia becomes known to students who have declared it on their QNR response. This is important as one of the undercurrents to the project is the issue of the stigma associated with being labelled as dyslexic, especially as this may emerge as one of the factors that contribute to reduced Academic Behavioural Confidence in students with dyslexia compared to their peers. To explore this, QNR respondents who were declaring their dyslexia were also invited to complete a sentence in the opening section of the QNR to report how they learned about their dyslexia: The summary grid below sets out this data from the 68 responses in research group DI. The grid total is 64 as 4 respondents in research group DI did not select options. 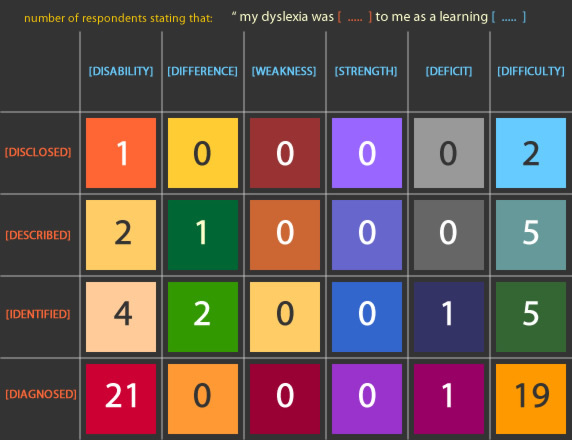 It is disappointing to note, although entirely expected, that the majority of students reported that their dyslexia was ‘diagnosed’ with diagnosed as a disability slightly ahead compared with disagnosed as a difficulty.In my view, the most appropriate way to report dyslexia to an individual is to identify dyslexia as a difference as this is most certainly likely to reduce negative connotations of it being noted as ‘disability’ such that this is constructed in society more generally (eg: Connor & Lynne, 2006, Phelan, 2010), and to also remove associations of dyslexia being something ‘medical’ as implied by ‘diagnosing’ it. It is of note that only two students out of the 64 who provided this information reported that their dyslexia was ‘identified’ to them as a learning ‘difference’. This may be an indication that assessors might usefully reframe the terminology that they use to more positively identify dyslexia to students and to move away from legacy descriptors rooted in a kind of psychological determinism which strives to attribute dyslexia as a deficit rather than a natural occurrence of human neuro-diversity (Cooper, 2014). My view is that this adds evidence to the argument that it is a literacy-based education system that reduces those with a learning profile labelled as ‘dyslexic’ to a position of learning disadvantage, and so it is learning environments that need to be changed, rather then people with dyslexia, fixed. (See also: Thompson et al, 2015). However this is a complex discussion and one that will be explored more comprehensively in the literature review of this project and in the discussion of the results later on. It is also worth noting from the summary table that at least the number of students who reported their dyslexia as a ‘difficulty’ (31) was marginally higher than those reporting it as a ‘disability’ (26). Connor, D.J., Bejoian, L.M., 2006, Pigs, Pirates and Pills: Using film to teach the social context of disability, Teaching Exceptional Children 39(2), 52-60.
Cooper, R., 2014, Neurodiversity and dyslexia: challenging the social construction of specific learning difficulties. Available at: http://outsidersoftware.co.uk/wp-content/uploads/2012/11/Neurodiversity-and-Dyslexia-Challenging-the-social-construction-of-specific-learning-differences.doc. Phelan, S., 2011, Constructions of disability: A call for critical reflexivity in occupational therapy, Canadian Journal of Occupational Therapy 78, 164-172. Thompson, C., Bacon, A.M., Auburn, T., 2015, Dyslexic identities in online forum postings. Disability & Society, 30(9), 1328-1344.